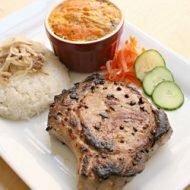 In our very first post, we made a classic Vietnamese rice dished called com tam suon bi cha (broken rice with pork chop, pork skin, and pork egg custard). Even though this dish originally arose from a culture of poverty–the Vietnamese rice farmers couldn’t sell the broken grains of rice so they used it for themselves–today, you can find this dish served in almost every Vietnamese restaurant due to the simplicity as well as the variety of toppings available, including the very popular Tau Hu Ky (bean curd wrapped shrimp). 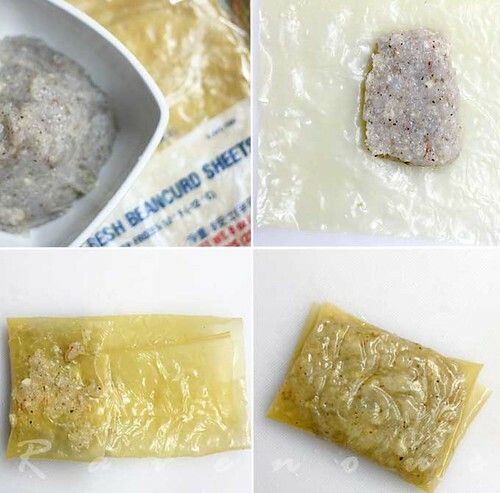 The bean curd wrapper is made from the film that rises to the surface when tofu is made and is commonly used as a wrap in a wide array of Asian cooking. 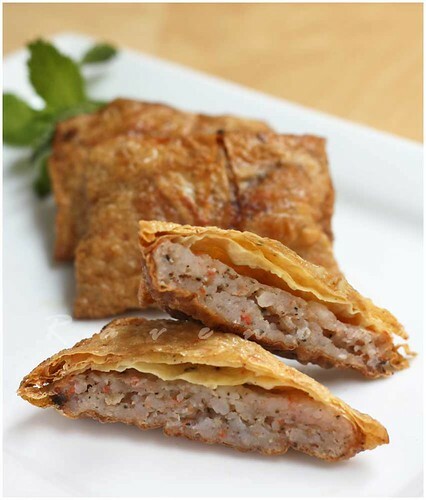 When fried, this turns into a crispy shell contrasting the deliciously moist shrimp paste inside. 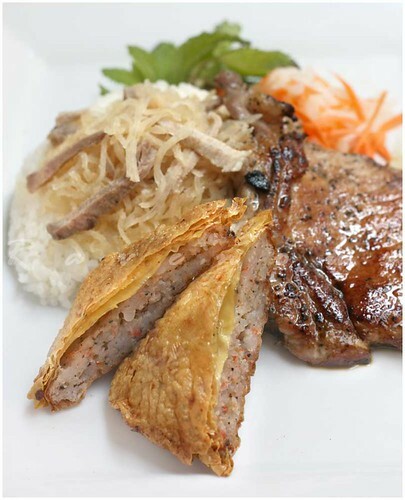 The entire com tam recipe is composed of several parts. The bi (pork skin) and the tau hu ky can be made in advance as both store well in the freezer. We always keep some bi in the freezer as it holds for well for at least several months. Tau hu ky can also be served alone as an appetizer using nuoc mam cham as a dipping sauce. Approximately 1 lb Cooked, shredded pork skin. Found in Vietnamese /Asian grocery stores in the frozen section. 1/2 lb. pork shoulder or other nonfatty pork meat, cut in rectangles about 3 x 2 inches. First thaw the pork skin in the fridge the day before you plan to make this. Submerge pork skin in slightly luke warm water with a pinch of salt. Do not use hot water as this may congeal the pork skin together. Let the skin rehydrate about 20-30 mins. Drain and allow to dry before mixing. Also day before, cook the pork. The quick way is to boil it, but mom says the traditional way is called “ram” which means to fry in a small amount of water, bit of sugar and salt. This way imparts a beautiful flavor to the pork. Cook until done and store in fridge overnight or until cool. Thinly slice into matchstick size. Mix the dry pork skin, pork, salt, and approximately 2-3 oz. of roasted rice powder and garlic thoroughly. Add more roasted rice powder or garlic to taste. Set aside in the fridge until ready. This mixture stores well in the freezer 1-2 months. Try to make the bi (pork skin) a day in advance, or better yet keep some in the freezer. Ideally you should defrost this in the fridge overnight, but if necessary, you can defrost in microwave–but be gentle and use very sparingly and check often as excessive heating will cause the pork skin to be overcooked and shrink. After defrosting, the heat from the rice will adequately warm it up. Marinade the pork with fish sauce, sugar, garlic, oil, and thick soy sauce ( different from regular soy sauce and found in Asian groceries and provides a very nice dark caramelized color to the chops) for min 2 hrs . Pan fry or grill the chops. Serve with broken rice, tau hu ky, sliced cucumbers and tomatoes, pickled carrots and daikon. 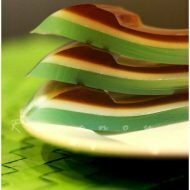 Dress with nuoc mam cham and enjoy! 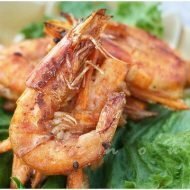 Prep the shrimp and pat dry with paper towel. Combine shrimp, salt, fish sauce, ground pepper and garlic and blend until well minced. If you use the fresh tofu wrap, it comes in a very large round shape. We cut it down into square shaped pieces about the size of egg roll wrappers, 8 x 8 in. If using the dry tofu wrap, wet with paper towel until moist and easy to wrap. The size and thickness of how you roll them is up to you, however, most restaurants serve them as small rectangles about 1/2 in thick. Place about 3 tbs of the shrimp paste at one end of the wrap and fold the ends over like you’re gift wrapping a box. Use a little bit of shrimp paste to seal the edges (see above photo, bottom left). You can also roll them eggroll style if you like. Deep fry until golden brown and drain on frying rack or paper towel. Serve alone as an appetizer or as part of com tam tau hu ky.
Oh I am loving this dish. So bad I have allergy with pork so I have to change the recipe accordingly. This looks challenging, but well worth the adventure. You make quite a case for the dish in your description of the crispy bean curd wrapper around the tender shrimp paste filling. My mouth is watering! I found you on TasteSpotting and am writing to say that if you have any photos that aren’t accepted there, I’d love to publish them. Visit my new site (below), it’s a lot of fun! I hope you will consider it. The awesomeness of your recipes is getting out of control! Seriously. Love dau hu ky! I love the food you make. I wish I could come over! I always end up eating the same thing whenever I go to Vietnamese restaurant – mostly because I'm not sure what they are. This looks delicious and I'll definitely give it a try! Thanks for sharing the recipe. I love getting your Vietnamese recipes for these traditional dishes. Very impressive! Tastestopping: Great concept. We'll have to check out your site when it's done. Gastronomer: Thank you so much for reading. We just love to make Vietnamese food. Ninette: We wish we could share as we never make anything just for two! Em: We hope you continue to read because we love to share all the different delicious varieties Vietnamese cuisine has to offer. Krissy: We really want to focus on Vietnamese because we really want to preserve our mom's and family recipes. Thanks for comments! I am really enjoying your blog. I wish I had explored more Vietnamese food before going vegetarian, but I still eat seafood, so perhaps I can at least use some of these recipes for inspiration! I bought some yuba sheets recently, and this looks fabulous! ghweiss: Thank you very much! Vietnamese cuisine uses lots of fish and seafood so you can still enjoy it. Try our ca kho to, braised caramelized fish in claypot!